Fantasy Faire 2019 started on April 18th, you need to get down there! I got my demon on with the help of Sinful Needs Children Of The Night Omega evolved applier skin. I really love the barely visible just under the surface veins showing under the eyes and on the chest. Super creepy! Sinful Needs can be found at Fantasy Faire 2019 on the Twilight Spring sim. I LOVE these Demon arms! They come in lots of colors and some are transparent like mine so you look through the skin to see bone underneath! Brilliant! Mine are a kind of dried blood color (LOVE!) with nice sharp talons. These wonderful arms are by Ghoul and can be found at Fantasy Faire 2019 on the Twilight Spring sim. Purchases made from the Relay For Life vendors in each store benefit the research and projects of Relay For Life/American Cancer Society, so while you shop for cool stuff and gape at the amazingly creative sim builds, you are helping to treat and help eradicate cancer! This photo was take on the Fantasy Faire 2019 Quest sim of Thornfast. Fantasy Faire 2019 Fairelands Junction portals to all sims. 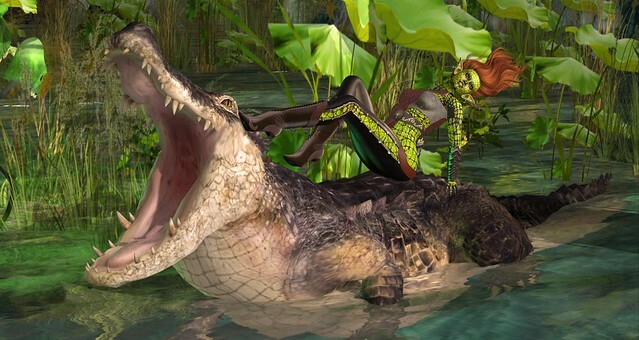 Here I am in the beautiful Byounimba sim at Fantasy Faire 2019, hitching a ride with a relative. ;D This Jeanette’s Joint skin, one of the Duality series (more colors available) , reminded me so much of an old American tv series called “V” about reptilian alien invaders…I couldn’t resist! How can YOU resist, you get to come to Fantasy Faire to get it! Jeanette’s Joint is on the Bayounimba sim. My outfit, by Scarlet Fey, includes Elven Asym pants, boots, dragon top, coat and gauntlets. Mine is in red, there are several colors to choose from. 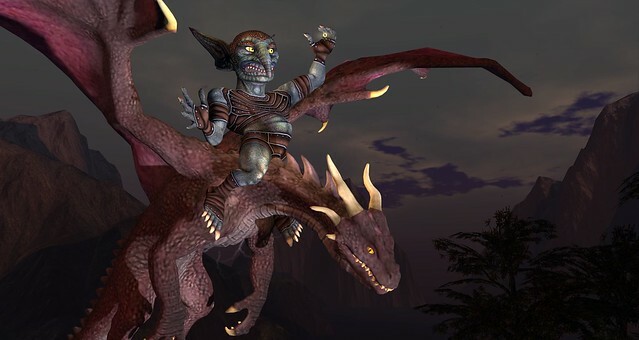 Scarlet Fey is located on the Faireholm sim at Fantasy Faire 2019. Fantasy Faire is all about helping Relay For Life/ American Cancer Society with it’s projects and research to help treat and eradicate cancer. Every store in Fantasy Faire has at least 2 vendors from which 100 percent of the proceeds benefit Relay For Life. How can you lose? Get yourself something cool, ooh and ah at the amazingly creative sim design, dance, listen to music, attend shows and and galleries….!!!!! Fantasy attire not your thing? Enjoy the music, shows and ambiance, and throw some lindens into any of the many scattered official kiosks around the sims. See you there! Come and support Relay For Life/ The American Cancer Society’s efforts, all the stores in Fantasy Faire have at least 2 vendors from which ALL proceeds go to Relay for Life, as well as gachas and lots more great stuff! There will be shows, a quest, music….! YOU GOTTA GET YOURSELF HERE!!!! Enchantment is open! This round’s theme is “Lord Of The Rings”! There are so many cute/beautiful/amazing things out for Valentines Day! I couldn’t believe this gown when I saw it! This is the Passionate gown in Valentine mix color, available in solid red and other colors from Moon Amore. This is an over the top Valentine’s Day gown, with a tremendous amount of flower trim and beautiful textures, a delicate net holding applied flowers at the neckline and the back, lace trim, just gorgeousness! My amazing set is the Boho Fae Floating Island Valentine Edition from The Looking Glass. It is a beautiful set for dancing or furnishing, and a beautiful romantic spot for home or roleplay sim. You get the Gazebo, flower and vine trim, and you can turn on particle effects. I have used the Gold Hearts, there are different effects in each column, gold hearts, red hearts, stars, and a soft fog for the floor! There is a chandelier with on/off switch (not pictured). I love Valentine’s Day! 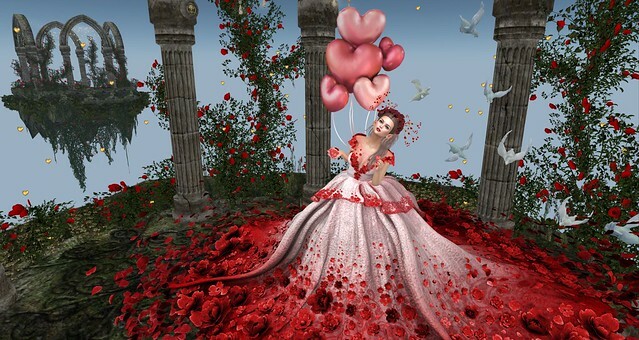 Moon Amore- Passionate Gown, @ Cupid Inc.
Caboodle- Sweetheart Balloons @ Cupid Inc.
ChicChica- Sugar Heart Jelly pose and props @ Cupid Inc.
Ersch- Hairpins w/HUD (There are hearts on the hairpins) @ Cupid Inc.